Low-power nonprofit FM stations are the still, small voices of media. They whisper out from basements and attics, and from minuscule studios and on-the-fly live broadcasts. A knowledge of geography is essential if you are running a tiny, 100-watt radio station. Hills are bad, for example, as are tall buildings. Saltwater, though, which lies at Seattle’s doorstep, can boost a radio signal for miles, like a skipped rock. “We’re bootstrapping it,” said Eric Muhs, a physics and astronomy teacher. Headphones were slung around his neck, and a mop of unruly gray hair came further undone as he leaned into his laptop trying to fix a software glitch. But Muhs, 60, one of KBFG’s founders, admitted the stakes for failure were relatively low. “Almost nobody knows that we exist,” he said. Low-power nonprofit FM stations are the still, small voices of media. They whisper out from basements and attics, and from minuscule studios and on-the-fly live broadcasts like KBFG’s. They have traditionally been rural and often run by churches; many date to the early 2000s, when the first surge of federal licenses were issued. But in the past year, a diverse new wave of stations has arrived in urban America, cranking up in cities from Miami to the Twin Cities in Minnesota, and especially in the Northwest, where six community stations began to broadcast in Seattle. At least four more have started in Portland. Some are trying to become neighborhood bulletin boards, or voices of the counterculture or social justice. “Alternative” is the word that unites them. “It’s an unprecedented time in our radio history when we have so many stations getting on the air at the same time,” said Jennifer Waits, social-media director at Radio Survivor, a group in San Francisco that tracks and advocates for noncommercial radio. Low-power FM stations can typically be heard for about 3 ½ miles if a bigger station or obstacle does not block the signal. Of the nearly 2,500 such stations in some stage of licensing, construction or active broadcast across the nation, more than 850 have a license holder with a religious affiliation. Washington has the second-highest concentration of them among the nation’s 15 most populous states, with 68 stations for 7.4 million people, according to the Federal Communications Commission (FCC), second only to Florida. New York, by contrast, has 54 stations, but nearly three times Washington’s population. Oregon — while not among the 15 most populous states, with 4.1 million people — is even more saturated than Washington and Florida; it has 80 low-power stations, most in rural areas. You want weird? Turn the dial. One station in Seattle invites listeners to phone their dreams and fantasies into a recorded line, and then puts them on the air, at least the ones that don’t raise concerns about FCC indecency rules. Russian-speaking residents in Portland have their own tiny station. And if you want to be charmed by a 5-year-old boy chatting with his father at bedtime about dinosaurs, music and his sometimes bothersome sisters, you can find that at Tristan’s Bedtime Radio Hour, broadcast on Sunday nights on KBFG in Northwest Seattle, where Tristan lives. It also streams on the web. What low-power urban radio creates, believers say, is a sense of community, a defined physical stamp of existence that goes only as far as it can be heard. So new licensees and programmers are knocking on doors near their antennas and holding fundraisers at the local brewpub. That’s a contrast to the amorphous everywhere-but-nowhere world of the web, and the web-streaming radio or podcasts that a few years ago seemed most likely to take center stage in low-budget community communications. 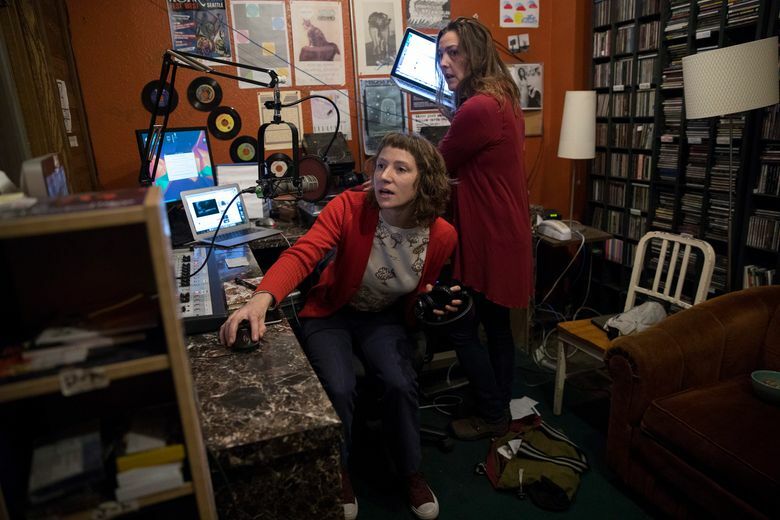 “When you start broadcasting, it’s like you have a storefront,” said Rebecca Webb, founder of the Portland Radio Project, KSFL 99.1, which broadcasts from two rooms above a closed silent-movie-era theater built about 1915. The station promises to play a Portland-area music group every 15 minutes, and in a time of media consolidation, Webb said, that’s a political act. Many community groups with no money and often no experience in radio got help in starting their stations. A Seattle-based event-ticketing company with a social mission in working with nonprofits allowed a staff organizer, Sabrina Roach, to help people manage the FCC process with seminars, training and advice. In Oregon and California, a group called Common Frequency jumped in, especially in rural regions, helping people get licenses as they came available. In Philadelphia, the Prometheus Radio Project led a fight to get the FCC to relax rules to allow more low-power FM stations, especially in urban markets, which big broadcasters had opposed. The recent FCC vote to end net neutrality, under which internet users were guaranteed equal speed and access, might not directly affect small radio broadcasters that do not livestream. But advocates said the decision amplified the importance of small voices, however they are expressed. Clara Pluton, a stand-up comedian in Seattle who pays the bills by waiting tables, hosts a radio show with Val Nigro, who also does comedy, every other Tuesday night on Hollow Earth Radio, KHUH 104.9. The station began broadcasting in the Central District of Seattle in September, and Pluton and Nigro are in their second month of “queer talk,” as they describe their show. There’s no salary, no fame, no certainty of an audience of any kind, the women said in an interview at the station, but deep rewards in knowing that they are speaking out about their lives and their city. “It’s like members of the community broadcasting to members of their community,” Pluton said. Some volunteer DJs, like Bob Knowles in Portland, found a place in local radio after 25 years fishing for halibut in Alaska. He tuned in one day to KSFL, the Portland Radio Project, and liked it so much that he went in and got his own show, “Throwin’ it Back Thursdays,” playing obscure or forgotten musical tracks as one of the station’s 40-odd volunteers. Gary Dunn, 17, a junior at Ballard High in Seattle who was helping to broadcast the varsity basketball game, said he liked the surprise that KBFG offered of not knowing what might come next, a song he has never heard, a perspective in politics or in life that is unfamiliar. He also likes that radio is an old technology, one his great-grandparents would have known. “Old devices still help us,” he said. 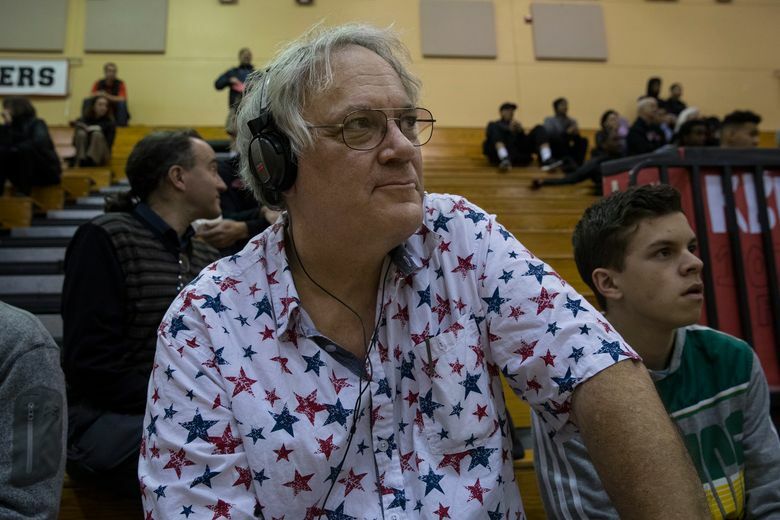 Muhs, the physics teacher, ultimately got his software running in time for the Ballard Beavers’ tipoff against the Franklin High Quakers. But it wasn’t the Beavers’ night, and they lost, 39-70.